Lots of old Israeli brass items, including: 1. Shabbat candlesticks decorated with burning work and the inscription "Jerusalem" at the base, 2. Sabbath candlesticks made by Weinberg, 3. 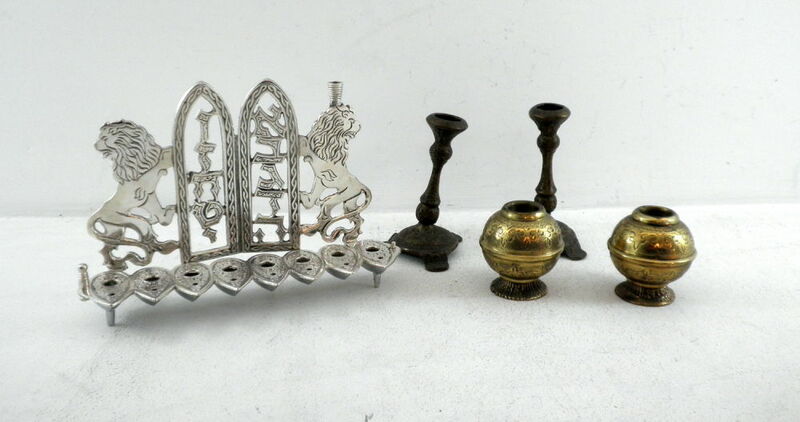 Nickel plated brass menorah, oil lamps, goblets form of ancient oil lamps, back decorated with the Tablets and a pair of lions and Torah. Length: 23 cm, candlesticks height: 7- 13 cm.